Alan Pardew bridled at the suggestion that Newcastle United’s Premier League race is run for another season. These are days of flux on Tyneside and we wait for something to fill the vacuum. If Newcastle have a grand plan for a summer that is ready to spring into action, they are doing their best to keep it very well hidden from those inside the club who are just as much in the dark as the rest of us about Mike Ashley’s intentions. The three most pressing questions at the moment appear to be whether Ashley is beginning to seriously source a buyer for the club again, whether he intends to retain the model that he put in place in the summer with the appointment of Joe Kinnear and whether the lack of permanent signings over the past nine months represents the new reality of the club’s transfer dealings – or if it was just the consequence of a director of football whose presence stopped others from doing their job. It is already a matter of speculation within the corridors of St James’ Park that Ashley, who had been remarkably hands-off during January, has been unusually quiet. He acted swiftly and brutally with Kinnear but that was apparently his first decisive call of a month when it was relatively clear from the off that Newcastle’s business would be very limited. The owner was meant to be at the Tyne-Wear derby but instead flew to Ireland to conduct business. It is a long, long time since he took his seat at St James’ Park, and not since the autumn has he been publicly pictured at a Newcastle away game. There has been no formal approach to Derek Llambias to return to the role of managing director that he held until Kinnear’s appointment in June but the noises surrounding that are interesting. Llambias still speaks to Ashley, he still retains an interest in Newcastle. There has been no indication from those close to him that Ashley has spoken of selling the club. Yet still, he surely cannot allow the current vacuum to continue past the end of this season? United were able to collect themselves sufficiently to rise to eighth place in the league and dodge the relegation fight that sucked the life out of the club last term but Ashley must recognise that the slow draining of enthusiasm for the club is starting to encroach on those who would previously have considered themselves dyed in the wool supporters. Anecdotal evidence suggestions that some supporters are beginning to walk away. There can be little doubt that others are wavering. In the face of all this, Newcastle have one thing in their favour: time. There are three months between now and the end of the season and that represents plenty of time for United’s power brokers (let’s be honest, their owner is the only really crucial character in this unfolding drama) to formulate a proper plan to take the club forward. It is very rare that any club is given time to pause and think in the cut-throat world of the Premier League but marooned in the purgatory between a relegation fight and battling for one of the lucrative European slots Newcastle have been given the comfort of upper mid-table security. So Ashley needs to use it now to decide what his intentions are. Just recently there has been little or no direction but moving ahead there needs to be a Plan A, B and C – with every summer eventuality covered. They have time to source a proper candidate to become director of football if that is what the owner really wants. If he wants to sell, now is the time to make that actually happen. Don’t believe for a second that Newcastle’s season is over. On the contrary, these are the months that could well decide the long-term future of the football club – but only if Newcastle recognise how precious they can be. Pardew must do too. There are footballing issues to address and he can force the hand of the owner on a few of them by experimenting between now and the end of the campaign. First up, he must decide whether Hatem Ben Arfa – who must play every game he’s available for between now and the end of the season – is a busted flush. Then it is time to start using younger players and making brutal decisions on them. Similarly, the contribution of Steven Taylor and other senior players must be held up to account. No one should be off-limits. One of the issues to address is the future of loanees Luuk de Jong and Loic Remy. The latter has one more match of his three-game suspension to serve and that gives the former another opportunity to establish himself as a possible front-line forward. “He’s settled in very well. 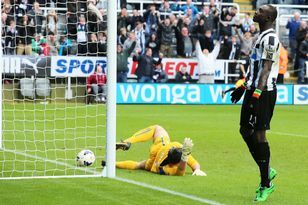 He knows Tim (Krul) very well and they look like brothers at times but I thought he did very well on Saturday against Chelsea,” Pardew said. “I thought he did everything he could on Saturday with the service he had. He never gave the ball away, he was strong and took the ball in.